Polyamory in the News: "Canada’s ‘polyamory’ community to descend on Vancouver for convention"
"Canada’s ‘polyamory’ community to descend on Vancouver for convention"
Canada's first PolyCon starts this evening (Friday) in Vancouver — and today, people walking by newsboxes and checkout counters all across British Columbia are probably doing double-takes at this family portrait of PolyCon organizer Zoe Duff and her two longterm guys. Tickets for PolyCon were nearly sold out as of two days ago, says Zoe. I hope the organizers are requiring good boundary agreements from reporters who want to attend. The PostMedia newspaper chain sure is taking an interest. Its flagship paper, the National Post, published the previous two articles that I excerpted here. The Province is part of that chain. The article itself seems factual and basically correct. The paper, though downmarket, seems to be old-school about separating news and editorializing. The article's original headline when it went up on the paper's site last night was Three’s not a crowd: Canada’s ‘polyamory’ community to descend on Vancouver for convention. Under that headline it became the second most-read story on the site. This morning it was reposted online under the headline below. 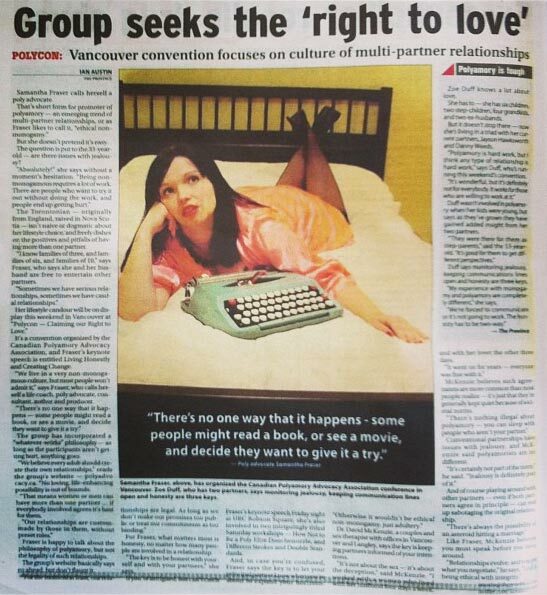 Samantha Fraser calls herself a poly advocate. That's short form for promoter of polyamory — an emerging trend of multi-partner relationships, or as Fraser likes to call it, "ethical non-monogamy." But she doesn't pretend it's easy. The question is put to the 33-year-old — are there issues with jealousy? "Absolutely!" she says without a moment's hesitation. "Being non-monogamous requires a lot of work. There are people who want to try it out without doing the work, and people end up getting hurt." The Torontonian — originally from England, raised in Nova Scotia — isn't naive or dogmatic about her lifestyle choice, and freely dishes on the positives and pitfalls of having more than one partner. "I know families of three, and families of six, and families of 10," says Fraser, who says she and her husband are free to entertain other partners. "Sometimes we have serious relationships, sometimes we have casual relationships." Her lifestyle candour will be on display this weekend in Vancouver at "Polycon — Claiming our Right to Love." The group has incorporated a "whatever-works" philosophy - as long as the participants aren't getting hurt, anything goes. Zoe Duff knows a lot about love. She has to — she has six children, two step-children, four grandkids, and two ex-husbands. But it doesn't stop there — now she's living in a triad with her current partners, Jayson Hawksworth and Danny Weeds. "Polyamory is hard work, but I think any type of relationship is hard work," says Duff, who's running this weekend's convention. ...courtesy Samantha Fraser, in the pic. Several hundred miles away, the article also appears today on the website of the chain's Calgary Herald. A version also ran in the city of Victoria's Times-Colonist: Three isn’t a crowd when it’s a comfortable triangle. Also, local polyactivist Kiki Christie and a partner were on Early Edition on CBC Vancouver Radio this morning. "That went well," she says. Listen here if the link works where you are; forward to 2:01:15. PolyCon is being put on by the Canadian Polyamory Advocacy Association (CPAA), which did such a great job of essentially winning the decriminalization of poly relationships in Canada in 2011. Wish I was there. Sounds exciting. Wish you were here too, Alan! I have to say, the reporter was really respectful and great to work with. I was happy to be dealing with him.